Yeay! The Awesome ChelleyReads @ Michelle and Leslie's Book Picks is very very generous to gave me another awesome award/ tag me to enjoy it. Thank you zillions! The rules of receiving the award is to list down all 10 things about myself. Well, I think I already listed a few about me on some of the awards like this before at here, here, and here. However, I love to let you know some more about me *wink2*. Here we go..
1) I am the eldest in my family, the spoiled one, and very sensitive person. Ha ha! 2) I love to travel. I went to a few interesting places in my country. The last time I went travelling to Brunei Darussalam and Sabah. I went to Beijing, China a in 2007 and that was the 1st time ever I went overseas (because it was sponsored by my university and other companies). Really enjoyed it. 3) I hate dentist! The idea of doing or going for an appointment with a dentist really makes my heart jumping. I don't mind of regular check or some dental thingy. It just the needle that I'm afraid of. I know, LAME! 4) Cats hate me. Vice versa. 6) I'm a coffee addict. Can't live my life a day without coffee. I might being jinxed! 8) As a book lover/ bookworm, I buy at least one whenever I go out. But I will treat myself something more than that if I've reached my goal in something. Like if I score A for Biology, I will buy myself a new shoes. Or anything I have in mind. 9) I have car license but not motocycle license. However, I have only a scooter not a car and ride it illegally everyday to the faculty. I always run away/ avoiding from a road block and from police. My life is sure an adventure! Ha! So, there they are, my 10 things about myself. Time to spread the love! I would like to share this awards with a few and hope they will love this. Congratulations on your award!!! And thank you for passing it on to me. This award is new to me. I take these awards seriously, it makes me feel that someone likes my blog and I am part of this friendly and fantastic book blog community. I will be posting about it later today. Oh thank you! That is so sweet! :) I will pass it along soon! @ Cheryl = I amd so glad you like it. Time to spread the love girl! @ Sheila = Hope you like it! Congratulations on your award and thank you for passing it on to me. I will try to have my answers up by the weekend. @ Jennifer and Melissa = Thanks. and congratulations! Thanks so much, Darlyn! You're the best. I loved your list of facts. You made me laugh! It is nice to know more about you too because you are a great blog friend to me! #4 is the best. Probably because I'm the same way. hehe. 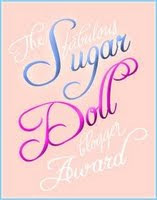 Congratulations on the Sugar Doll Blogger Award and thank you for passing it on to me! Interesting facts about yourself that you shared!